In hotel "Armira" are combined both wellness and balneo treatments. There is a medical center, where the procedures are appointed by Dr. Gechev - the most famous specialist in diseases of the spine. Available at the hotel are therapist, physiotherapist, physiotherapist and beautician. One of the main procedures offered in complex "Armira" is the curative gymnastics, which could be in group, individual or underwater. The SPA center offers electro, - aerosol therapy as well as reflexology. The complex has light therapy, thermotherapy sector and offer combined ultraviolet (UV) treatments with sea lye compresses. These procedures are recommended for degenerative joint disease. 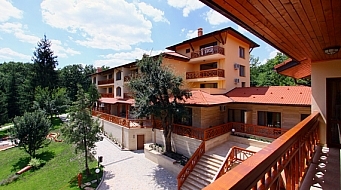 The applied methods of treatment with mineral water in resort Starozagorski Mineralni Bani are slightly accepted from the body and provide the following therapeutic and prophylactic effects: mechanical and antigravity pressor, sedative, hypotensive, diuretic, anti-inflammatory and antitoxin, as well as a general strengthening.